Tapalicious is a fun, privately bookable Barcelona tapas tour, that’s suitable for both large and small groups. This is 3-hour tapas food tour, that combines the best of Spanish tapas and drinks as we explore old Barcelona. We start our afternoon’s experience with drinks, overlooking Barcelona’s marina. You’ll get to know your guide and the days events, as we share some of the intertwined history and culture of the areas, to set the scene for the rest of your experience. Over the next few hours we wander Barcelona to visit three more tapas food stops, savoring dishes from different parts of Spain and enjoying the drinks that are paired with them. Our final stop is a charming bodega to indulge in a delicious lunch, washed down with a beautiful Spanish red wine. Throughout your tour we share insightful stories about the origin of the dishes and drinks, we try a fun and traditional way of drinking wine as you hear about the history, culture and traditions of the city. It’s a fantastic way to see Barcelona while tapas hopping (eating & drinking) your way through the city! My wife and I have been on food tours in cities around the world. This is simply the best. Our guide was so knowledgeable, charismatic, and fun! If you do one tour in Barcelona, make sure it’s this one. You will not regret it! Starting at €380 inclusive for 2 people, with each additional person only €60. This includes all food and drinks (cava, wine, non-alcoholic) during the experience and Spanish 21% IVA tax. Our private tours operate Mondays to Sundays with flexible start times. We visit 4 spots where you indulge in over 10 dishes. We cater for most dietary restrictions. We suggest a maximum of 20 people per tour, but can run larger groups if requested. We explore 2 neighbourhoods as we stop to eat and drink where the locals go. Our meeting point is in front of the Correos (post office) in Plaça d’Antonio López, 08002 Barcelona. Tapalicious is a fun, privately bookable tour – suitable for both large and small groups. 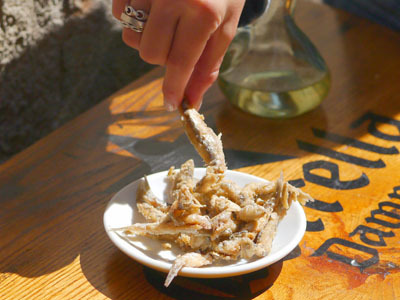 Our journey will see us tapas hop our way through 2 of the oldest neighborhoods in Barcelona. From our drinks overlooking the marina to 3 more hidden away spots, we combine the best of Spanish tapas food and drink, with the stories of its history and culture. It’s a fantastic way to see Barcelona while tapas hopping your way through the city! Tapalicious – Barcelona Tapas Tour. A delicious evening of food, drink & lots of laughter! Tapalicious is a fun, privately bookable Barcelona tapas tour, that’s suitable for both large and small groups. This is 3-hour tapas food tour, that combines the best of Spanish tapas and drinks as we explore old Barcelona. 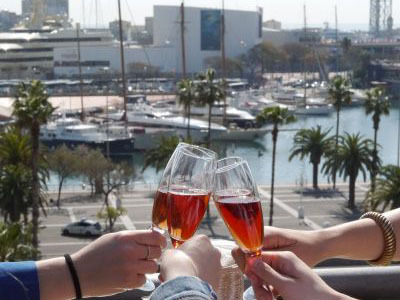 We start our afternoon’s experience with drinks, overlooking Barcelona’s marina. 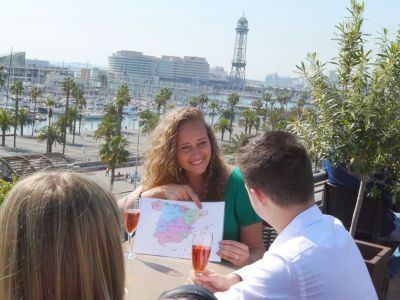 You’ll get to know your guide and the days events, as we share some of the intertwined history and culture of the areas, to set the scene for the rest of your Barcelona Tapas tour. Over the next few hours we wander Barcelona to visit three more tapas food stops, savoring dishes from different parts of Spain and enjoying the drinks that are paired with them. Our final stop is a charming bodega to indulge in a delicious lunch, washed down with a beautiful Spanish red wine. and traditional way of drinking wine as you hear about the history, culture and traditions of the city. What an amazing experience…. not only were the hosts awesome, the food was great, the bars and restaurants were stunning. This tour is much more than a culinary experience but also a historical insight to Barcelona. I am so happy to have been a part of this great event during my 5 day stay!